This is a guest article from Jeremy Antley who is currently pursuing his doctoral research on Russian Old Believers that immigrated to Oregon in the 1960′s. When not rummaging through the archives or taking care of his two dogs in Portland, Oregon, he also takes time to write about all things (digital) culture, (Russian) history and (board) games related on his blog Peasant Muse (peasantmuse.com). Before diving into my thoughts on using board games to explore interpretations of history, I would like to offer a personal gaming anecdote as a set-up to the larger discussion below. It involves the strange fate of Imperial Russian troops who found themselves in possession of the United States eastern seaboard. 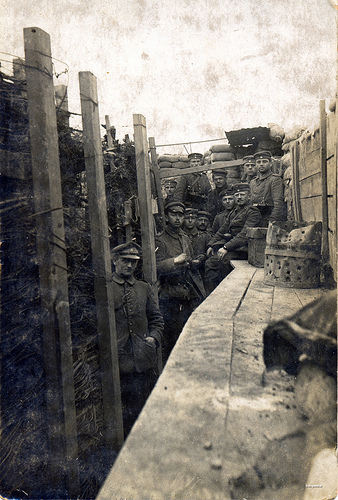 As a high school student, I participated in a week-long summer history course surveying the events of the First World War. The instructor told us that we would spend half the week role-playing a simulation portraying the major powers involved in European politics around the second decade of the twentieth century. As luck would have it, I and another student I knew well drew the assignment of Russia. In order to ‘win’ the simulation, nation’s needed to secure a set amount of ‘economic points’ through either trade deals or military conquest of other’s lands. I convinced the German players to secretly ally with Russia, on the condition that Russia would invade the United States. There was only one problem- Russia had few transport ships to ferry troops needed for a trans-oceanic offensive. Getting the needed ships was a top priority and this was accomplished through pure subterfuge. During an open negotiation period, I told the US that Russia needed ships to facilitate a western invasion of Germany that would be unexpected and fatal to the Kaiser’s forces. The US agreed, and informed the simulation’s moderator, our instructor, that Russia could ‘borrow’ a small armada of ships for the next turn. 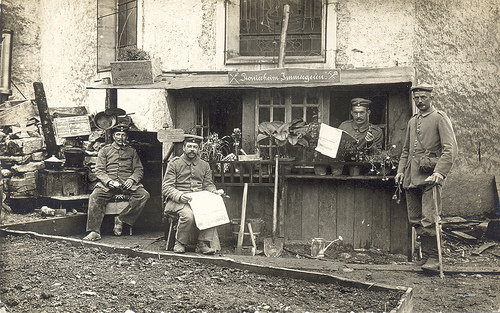 I couldn’t help but notice the instructor smile as he read the Russian orders submitted only a few minutes later, instructing the newly borrowed US ships to transport Russian troops not to the western front of Germany but to the weakly defended eastern shores of the United States. Instead of quickly cutting down the few troops garrisoned in the eastern United States (the simulation map was divided into large, territorial sections), Russian soldiers found themselves either at a stalemate or losing end of several ‘attack rolls’. Only after sacrificing over half of the troops committed to the attack could the Russian empire claim to hold the eastern United States, yet these gains quickly receded under pressure the following turn from a US-UK combined force counter-attack. Denied the ability to re-supply weakened troops, the Russian empire eventually lost their forces in the United States and spent the remainder of the simulation holding off separatist nationalist movements from disaffected minority groups within Romanov borders. At the end of the simulation, during our debriefing and exploration of what we took away from playing our respective nations, the instructor revealed two key insights. First, even though every nation almost immediately engaged in war as a means to achieve simulation victory, nowhere in the rules were players forced to use warfare to attain their goals, and second, a closer look at the combat results table for attack rolls made it obvious that for two-thirds of the results the attacker would either lose or fight to a stalemate, while the remaining third of the results would provide a victory of usually minor consequence. Having grown over-confident with our diplomatic maneuvering in securing alliances and devising treacherous plans, few players took time to consider the effects of a drawn-out war or reversals of fortune on the battlefield. In October of this past year, I wrote a post (http://www.peasantmuse.com/2011/10/course-design-process-history-through.html) on my personal blog, Peasant Muse, about designing a mid-level college course using board games to explore historical subjects. Drawing on two different sources for pedagogical inspiration, Chad Black’s ‘Teaching Philosophy’ post (http://parezcoydigo.wordpress.com/2011/09/26/teaching-philosophy/) on his blog Parezco Y Digo and Play the Past’s own Mark Sample discussing course design (http://chronicle.com/blogs/profhacker/teaching-for-uncoverage-rather-than-coverage/35459) on the higher-education focused blog ProfHacker, I outlined basic features in both structure and goals I wanted my ‘History Through Games’ course to possess. After briefly touching on what theme the course should focus upon (I tentatively chose American History), I then shifted to addressing the question of whether or not board games could be considered historical artifacts worthy of study (my answer was in the affirmative) before ending on a question of appropriate text selection. I won’t revisit details here- instead I want to focus on the comments my post received and additional thoughts I’ve had on the subject of analyzing board games as platforms. “I don’t assign “secondary sources”/representations without considering (for example) the position of the author in the larger discourse, the validity of their research, the argument they seek to make, etc. On this basis, Twilight Struggle mostly fails: it’s not part of a larger discourse or debate historically; I wouldn’t trust its “facts” per se; it does…provide us with an important perspective (the view that the Cold War was a bipolar contest; a valorization of the domino theory; etc.). Now, I think this view of the Cold War is wrongheaded and probably would not assign a secondary source with that p.o.v. Instead, I would like (for) primary sources to make that point. I was glad Dr. Blitstein brought up these points in his commentary, because they addressed issues I initially glossed over when presenting my ideas. The concern expressed above, on whether or not board games can be considered historical primary source ‘documents’, is tied directly to the subject of my previous post on the validation process involved in gaming counter-insurgency models. Many board games that explore historical subjects do so, often, on foundations of informed and researched perspectives culled from a variety of primary and secondary sources. The board game, as a historical artifact, should always be seen as a secondary source, especially when it is at rest. Looking at the rules, designer notes, game materials, etc… provides the astute observer with several points of inquiry for historical analysis. 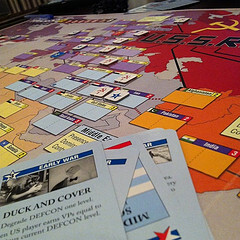 Using the example of Twilight Struggle, one could use cards in the event deck alone as ‘highlights’ of the Cold War to explore in primary and secondary accounts, without even touching on how the game board depicts nations with stability numbers and connective lines of influence. 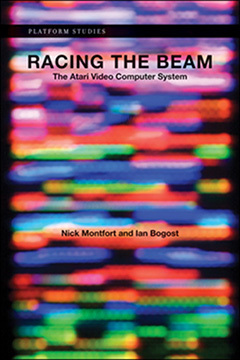 Yet a board game is more than a document- it is a platform, defined (in its purest form) by Ian Bogost and Nick Montfort in their seminal work, Racing the Beam (http://mitpress.mit.edu/catalog/item/default.asp?ttype=2&tid=11696), as “an abstraction, a particular standard or specification before any particular implementation of it.” They go on to say that a platform must take physical form and be used by people in order to directly take part in shaping and creating culture. It is entirely correct to raise concerns about the ‘facts’ presented in board games like Twilight Struggle because the game, by nature of being a platform, engages in abstraction of events depicted as well as delineating a standard around which those abstractions take form and coalesce. However, I’m less persuaded by the assertion that a game like Twilight Struggle isn’t “part of a larger discourse or debate historically,” because, specifically, there has been little work investigating board games as a platform of historical interpretation and, more generally, evaluating a board game as a platform requires observing its operation during the act of play, a process that in historical games requires the players to draw upon, generally, well known events, places or people in order to tie the theme to the mechanics. Furthermore if board games can be conceived as platforms then it would be wise to consider Mark Sample’s call to engage in ‘pre-platform studies’ (http://www.playthepast.org/?p=2324), especially in the context of evaluating the constructive process through which history is interpreted in these games. This means analyzing not only the primary and secondary sources used in creating the game, but also considering how game mechanisms evolved during development to suit the particular design abstractions. (Here is where access to play-tester reports and online forums would be most helpful) There might even be a possibility of ‘post-platform studies’ achieved through analyzing player mods of board games or how design mechanics are borrowed and tweaked to suit derivative or innovative game iterations. While my original post looked at using board games as a potential jumping off point for historical investigation, I’m now more inclined to say that board games can easily surpass this introductory function in history and even act as the lens of a course itself. Just as Bogost and Montfort in Racing the Beam note that “little work has been done on how the hardware and software of platforms influences, facilitates, or constrains particular forms of computational expression,” the same could be said of board games and their role as platforms in influencing, facilitating or constraining historical expression. As a means of evaluating the past and “engaging with the mentalities of the participants” in the past, primary documentary evidence is still one of the best sources historians utilize in constructing their arguments. But if we want a deeper examination of how the past is used to both inform the present and construct expressions of the past, which include elements of nostalgia, collective memory and myth-making, then board games approached as platforms offers a potential wealth of analytical opportunities to the larger discipline of history. Wow, a very thought-provoking post, thanks! Historical board games are at once historical artifacts and documents. I think they are more of the former than the latter, though. Sure, they are indeed products of their time, but because they are an attempt to render history in a somewheat more complex and involved way than the usual run of contemporary popular game, they can lay claim to be something more than a pure artifact. Games like “Juden Raus” (http://boardgamegeek.com/boardgame/11102/juden-raus), “Survivor” (http://boardgamegeek.com/boardgame/3623/survivor) or “Mall Madness” (http://boardgamegeek.com/boardgame/5086/electronic-mall-madness) are definitely sociopolitical artifacts, but that’s as far as they go – they don’t try to interpret the popular culture or history that they emerged from, they’re just simplistic games with tacked-on themes – or themes with tacked-on simplistic game mechanics, I’m not sure which. However, as you say, even a sophisticated simulation-type game is still limited by the contemporary understanding of history and culture. In that sense these games are more like novels or films – they are second-order interpretations of past or current events, and a consistent study of games from the period could prove very interesting, just as there are courses in the study of Georgian novels or Soviet cinema. It might be difficult to find someone with both the academic chops and the gaming experience, though! I’m glad you enjoyed the post, Brian. Thanks for commenting and presenting some great examples. On the question of ‘games with tacked-on themes vs. themes with tacked-on game mechanics’, I would argue that board games depend on the theme, in addition to aligning the operation of game mechanics with perceived beliefs of the period depicted, in order to create an immersive feel. Now the theme or mechanics might be simplistic, but the process involved in connecting the player to the theme through play often requires access to the meta-narratives that evolve within the general culture, through which the theme and the game exist. Take Tablut for example. a variant of the Tafl family of board games. (http://en.wikipedia.org/wiki/Tafl_games) Even though we know both the rules of play and the identity of the sides depicted (Swedes and Muscovites), we can only guess at the larger cultural narratives the game was supposed to tap when operated by players. In this sense, many board games require the player to bring their own experiences with them as they play, otherwise the act of play would become a mental exercise. I really do believe there is enough investigative potential in board games for historians to more seriously consider their role in our larger culture. It might be difficult, as you suggest, but with the rising interest I’ve seen in both the academic and commercial fields I believe the talent and interest will soon merge.